I’ve written about how I wish we had a brewery here in Salem. However, I’ve always thought we just need a restaurant or bar that serves amazing beer from the already existing selection of local beer we have in the Pacific Northwest. Salem, Oregon, please welcome Venti’s Cafe and Taphouse, which opened yesterday. My family and I went to check it out and we can gladly report that Venti’s taphouse is an amazing place to sample beers and get some great foot at the same time. The location for Venti’s is quite convenient, no matter what part of town you live on as the restaurant and taphouse has set up shop on Commercial Street SE in the building that used to be home to Buster’s Barbeque. The owners of Venti’s did a complete remodel on the interior and the new look is stylish and modern. The Venti’s Taphouse tries to be family friendly with an open feel and a dedicated kids area. As the Dad to a 1 and 4 year old, I can appreciate this, my daughters enjoyed the toys that could easily be retrieved from the kid’s area in the restaurant. However, the joy of Venti’s Cafe and Taphouse is the beer selection. There are 24 rotating taps that feature all types of beer from throughout the Northwest. Additionally, there’s an amazing bottle and canned beer selection bringing the total to about 124 available beers. I had the 10 Barrel India Summer Ale from Bend, Oregon and my wife had the Dupont Saisan Farmhouse Ale and both were amazing. The India Summer Ale is refreshing and flavorful and the Farmhouse Ale is a German-style light ale, I’d describe it as a Kolsh type beer with a slight bite at the end. The food selection spans pizzas, burgers, Asian inspired dishes such as Chicken teriyaki. it’s a bit of a mish mash of food selection but you can guarantee that there’s something for everyone on the menu. Overall the new Venti’s location (there’s one already downtown) is a welcome addition to the Salem restaurant scene. The amazing beer selection will impress any beer snow or connoisseur. If you want to see what’s on tap right now, visit twitter.com/ventiscafe as the taplist changes so often. 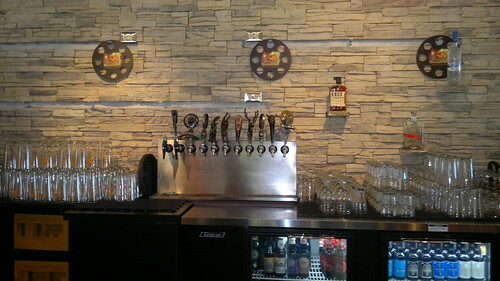 Nice critique and a good place to see Venti’s Cafe+Taphouse taplist is http://t.co/wTg1BuF. Or the long form http://salem.taplister.com/bar/show/2567-venti-s-cafe-+-taphouse.